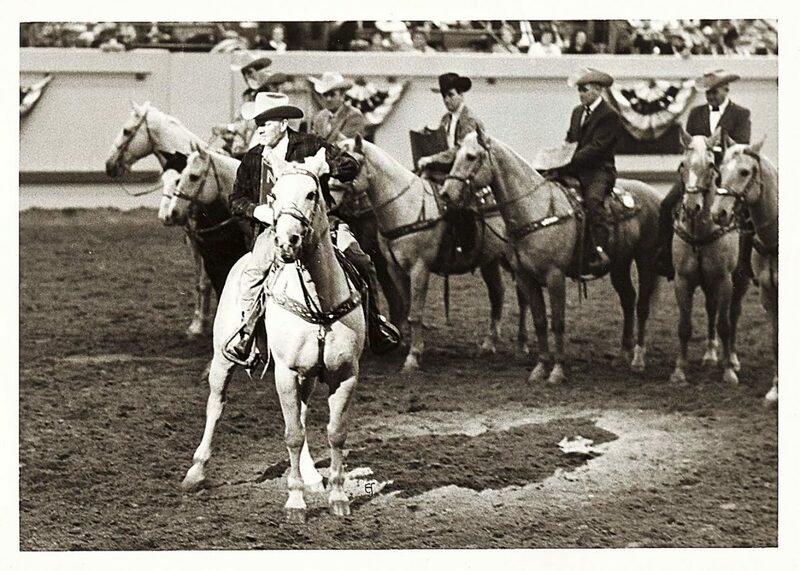 Feek Tooke accepted an award for a horse he raised, Sheep Mountain, on behalf of Rodeo Inc., at the National Finals Rodeo in Oklahoma City in 1968. He fell off his horse, dead, after leaving the arena. Feek Tooke’s story evolved into something far bigger. The film, Feek’s Vision, featuring interviews with rodeo names like Harry Vold, Larry Mahan, Ty Murray and many more, is set to premier Dec. 7, 2018, during the Wrangler National Finals Rodeo in Las Vegas, 50 years to the day that Feek fell off his horse, dead. He had just accepted an award for one of his horses, Sheep Mountain, on behalf of Rodeo Inc. at the NFR, hosted in Oklahoma City at that time. Tooke’s horses came by their size and agility from two unexpected places, a shire stallion called King Larrygo, bred primarily to the daughters of an albino Arabian stallion dubbed Snowflake. The two bloodlines intertwined and created talent that trickled down to current stock such as Powder River’s Craig at Midnight, Burch’s Lunatic Fringe, Frontier’s Medicine Woman, their own General Custer, and many more. “(Great) grandpa started bucking horses back in 1930, when most believed there was no way to breed a bucking horse; people thought they would get broke. The old, spoiled military horses and saddle horses were the bucking horses,” Toby Tooke said. “It took awhile, but he bought a horse out of Iowa, King Larrygo, a blue-ribbon winner at the Iowa State Fair, a full-bred Shire. He crossed him with those hot-blooded mares of Snowflake, and he was in the bucking horse business.” Tooke got one colt out of King Larrygo, before he was kicked and ruined, that continued the legacy. That colt was Prince. Tooke’s son, Toby’s grandpa, Ernest Tooke, kept bones for DNA tracing from Feek Tooke’s prodigy, General Custer and Gray Wolf, allowing for decades of bucking horses to be traced back to their significant stallions. “One angle Ken (Howie) knew would be beneficial is the genetic side. People might be interested to learn how well the bloodline records are kept,” Ken’s wife Theresa Howie said. “Dr. Gregg Veneklasen has been instrumental to the story; his knowledge is immense.” Veneklasen owns Timber Creek Veterinary Hospital in Canyon, Texas, and is known for his work in equine reproduction and cloning. In addition to preserving the bones, Ernest also retained rare footage of Tooke horses bucking in the 1940s through 1960s from rodeos in Ekalaka, Glendive, Baker, and Red Lodge, all in Montana. “There isn’t usually a lot of footage from that long ago. I’m excited to see how he incorporates that,” Toby Tooke said of Howie using the footage in Feek’s Vision. Howie is still traveling through the United States and Canada gathering interviews and footage for the film. He has already traveled an estimated 37,000 miles, and has about that to go, Theresa Howie said. He interviewed rodeo great Harry Vold just three days before his death, and has also interviewed such greats as Ty Murray, Deb Copenhaver, Dan Mortensen and more who are being kept back as an element of surprise in the film. Some of those mentioned are in the trailer of the film, which can be found at http://www.FeeksVision.com. Feek’s family still produces horses from his original broncs; they have about 65 to 85 at his ranch in Ekalaka, Mont. Feek Tooke is also the brains behind the Miles City Bucking Horse Sale, which is in its 68th year. He told Bill Linderman about the vision, but didn’t have the time himself to make it come to fruition. Toby’s dream came true for his great grandpa in 2008, and for one of their stallions, Gray Wolf, in 2016. The film will be released on DVD at the same time as its premier, and more information will be posted to the website as it becomes available.